MHA also recognizes the volunteer services of the University of Missouri Health Care’s Pascale’s Pals Student Chapter. The goal of Pascale’s Pals is to ease the burden on families and provide happiness to children during their hospital stay. The program pairs university students with adolescent inpatients at University of Missouri Health Care’s Women’s & Children’s Hospital. Student volunteers apply, and selected participants are trained through a formal onboarding process. The student volunteers provide crafts, entertainment, music, individual and group play opportunities, and special holiday activities to help the young patients feel less disconnected during their stay. 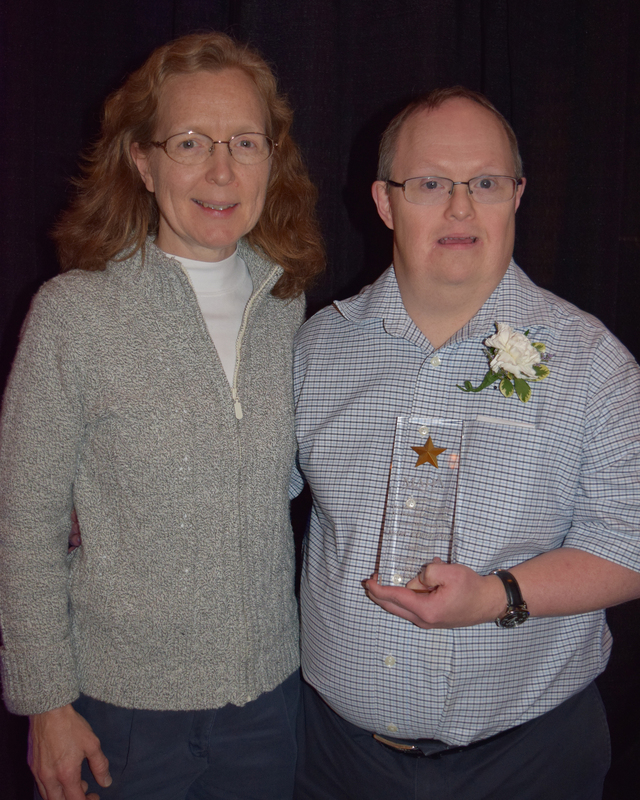 Highlight your hospital’s auxiliary or an auxilian during National Volunteer Week by submitting an Auxiliary of the Year or Auxilian of the Year award nomination form by Friday, June 30. A Senate committee held a hearing on House Bill 193. The legislation would allow local governmental hospitals in third-class counties to convert their property tax levy to a sales tax, upon voter approval to do so. 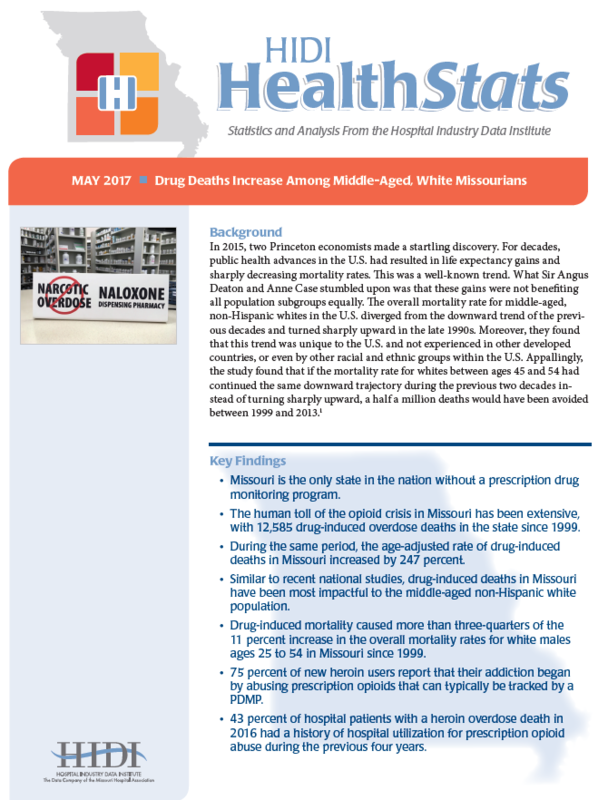 The May edition of HIDI HealthStats explores drug-related deaths among middle-aged, white Missourians. The human toll of the opioid crisis in Missouri has been extensive with more than 12,500 “deaths of despair” in the state since 1999, and an additional 551 last year occurring in a hospital setting alone. Opioid-related deaths have hardest hit middle-aged white Missourians, and while socioeconomic data are not available, recent national research suggests within this group, that blue-collar individuals with a high school education or less are most impacted. The overall mortality rate for non-Hispanic white males ages 25 to 54 in Missouri has increased 11 percent since 1999. Removing drug-related deaths from the statistics would have resulted in a 2.5 percent increase over the same period, indicating that drug overdoses caused more than three-quarters of the increased mortality for this cohort in Missouri. The CDC recommends a variety of evidence-based interventions that states can pursue to minimize the burden of opioid-related overdose deaths. Statewide prescription drug monitoring programs are among the most effective when deployed with policies that ensure universal use, real-time access to information, active management and limited barriers to use for providers and dispensers. Missouri remains the only state in the nation without a statewide PDMP. Read more. The U.S. Preventive Services Task Force has released a final recommendation statement that reports pregnant women should be screened throughout pregnancy with blood pressure measurements. The final recommendation statement also is available in the April 25 online issue of the Journal of the American Medical Association. The Centers for Medicare & Medicaid Services currently is reviewing claims and notifying practices about which clinicians need to take part in the Merit-based Incentive Payment System. Practices will receive a MIPS participation status letter by May from the Medicare Administrative Contractor. Clinicians should participate in MIPS for the 2017 transition year if they bill more than $30,000 in Medicare Part B allowed charges per year and provide care for more than 100 Part B-enrolled Medicare beneficiaries per year. MIPS is an important part of the new quality payment program, which is intended to shift reimbursement from the volume of services provided toward a payment system that rewards clinicians for their overall work in delivering the best care for patients. The Centers for Disease Control and Prevention recommends vaccinating babies from 14 serious diseases before age 2.